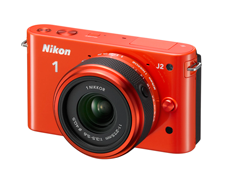 Advanced Camera with Interchangeable Lenses Nikon 1 J2, 1 NIKKOR 11-27.5mm f/3.5-5.6, Waterproof Case WP-N1. August 9, 2012 /Photography News/ Nikon Corporation today announced the release of the Nikon 1 J2, the latest addition to the Nikon 1 J series, advanced camera with interchangeable lenses, that propose new forms of imaging expression. The J2 offers a number of improvements in design and usability. An elegant design utilizing metal has been adopted, and the number of colors in which the camera is available has been increased to six, allowing users better expression of personal preference and individuality. A new Creative mode has been added to the four original shooting modes available on the mode dial, allowing for easy specification of the desired shooting scenes from a total of eight options, including Night Landscape. What's more, the J2 can be turned on or off using the retractable lens barrel button on applicable lenses, and monitor visibility has been increased with adoption of a high-resolution, 921k-dot LCD monitor. Along with the J2, Nikon will also be releasing the new CX-format compatible 1 NIKKOR 11-27.5mm f/3.5-5.6 2.5x standard zoom lens, which covers the 11–27.5-mm range of focal lengths (angle of view equivalent to 30–74-mm in 35-mm  format). 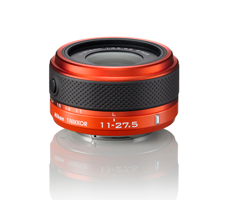 The 1 NIKKOR 11-27.5mm f/3.5-5.6 is smaller and lighter than the current 1 NIKKOR VR 10-30mm f/3.5-5.6 standard zoom lens for greater portability. It will be available in the same six colors as the J2, allowing for an integrated look for the camera and lens. The new Waterproof Case WP-N1, compatible with the Nikon 1 J1 and J2 (with the 1 NIKKOR VR 10-30mm f/3.5-5.6) will also be released. With the ability to capture high-resolution still images while recording movies, this new accessory increases the ways in which users will enjoy underwater recording by never missing the perfect photo opportunity.